It’s been hot this week. Triple digit hot. The kind of heat that makes you want to lie on a cool stone floor and not move. I’m sitting in my “office” on our shady front porch overlooking the yard, listening to the backdrop of our Labrador’s ceaseless panting as I write. Poor thing. I can strip down to bare essential clothing and guzzle lemonade, but she struggles under an all-season fur coat. We both hope the coastal fog will drift inland as it often does this time of year, but alas–Mother Nature has other plans. As the day wore on with no relief in sight, my thoughts turned to the approaching dinner hour. My appetite goes on hiatus in hot weather (along with my energy), and the last thing I wanted to do was cook over a stove. The prospect of firing up the BBQ felt like torture. I craved something light and refreshing that didn’t require any flames from kitchen to table. The only thing that sounded really good was the fat, ripe watermelon which had chilled in the refrigerator since my morning market run. But how to turn the object of my desire into a dinner worthy dish? 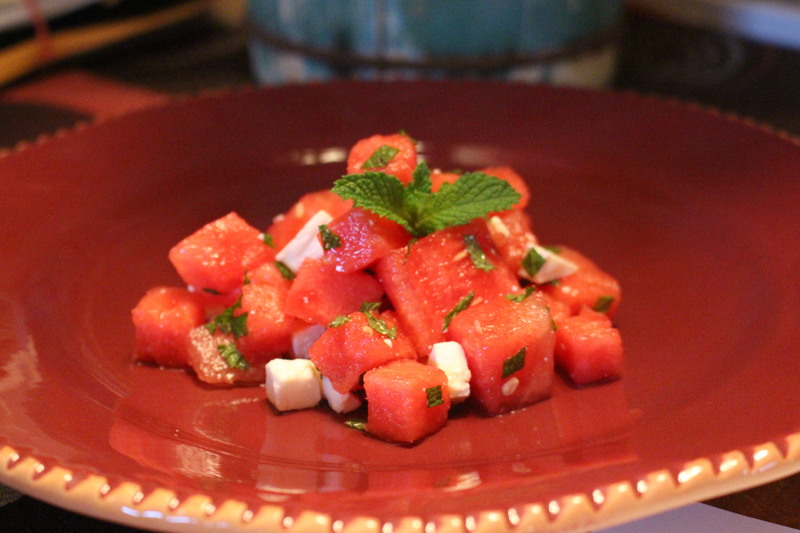 Then I remembered this favorite recipe for Watermelon, Feta and Mint Salad; a delicious combination of sweet juicy watermelon, salty feta cheese, and refreshing mint. Tossed with a little lime juice, this easy summer salad comes together in fifteen minutes or less (depending on your knife skills) and is just the thing for cooling down on a hot day. Combine the first four ingredients in a large bowl and mix gently. Season to taste with a couple grinds of fresh sea salt. Place in the refrigerator and allow flavors to develop for at least a half hour before serving. Use a large slotted serving spoon to transfer the salad to each plate and garnish with a whole mint leaf. Enjoy! Who needs ice cream when you have this refreshing, healthy, and super chill alternative! You could even eat this in place of dessert Debbie! It’s a winner Heidi. Cheers! Such a wonderful combination of flavors. This will be the first dinner I will think of during our next to hot to cook day. Thanks Karen! 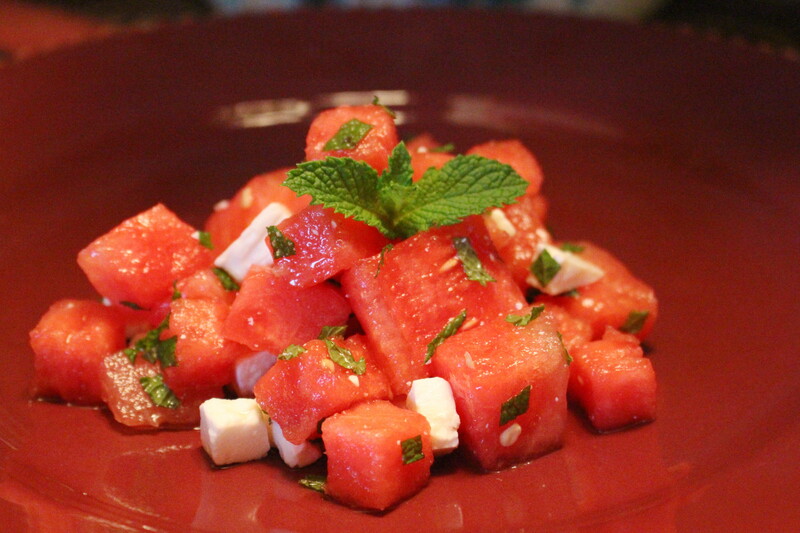 I never would have thought watermelon and feta would go together…I can’t wait to try this dish. Such a great unexpected combination, Nancy! Let me know how you like it. Yes, looks delightfully refreshing, pretty too! I love the simplicity of this dish Peggy. The fresh ingredients just shine! A very refreshing salad – great for this time of year. Agreed! It sure hit the spot last night 🙂 Thanks for reading Jovina!